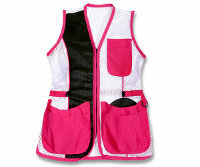 Stay cool and in the pink with the all mesh vest. White mesh front and back accented in Hot Pink. The Black leather International style shooting pad channel quilted for a smooth gun mount. Additional features include ventilated mesh side panels, double cargo pockets and a full lining. The signature Shoot the Moon draw-string waist not only tailors the vest to the shooter, but keeps the weight of ammunition off the back, neck and shoulders. Question posted on 03/31/2015 What would be the approximate cost or would you even do a custom color and designed vest ? Something similar to the vests you have , but different fabric colors . And do you have something like a size chart to determine sizing ? Yes, we can add a rear hull bag. Question posted on 04/19/2013 Does this all mesh come in khaki and white? Have a question about ALL MESH PINK & WHITE?